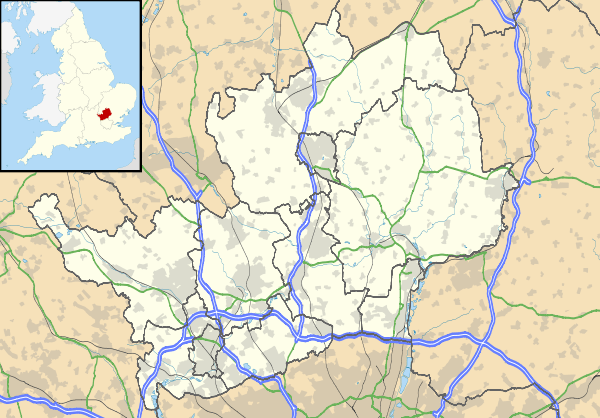 Hertfordshire ( i/ˈhɑːrtfərdʃɪər/[n 1]; abbreviated Herts) is a county in southern England, bordered by Bedfordshire to the north, Cambridgeshire to the north-east, Essex to the east, Buckinghamshire to the west and Greater London to the south. For official government statistical purposes, it is placed in the East of England region. 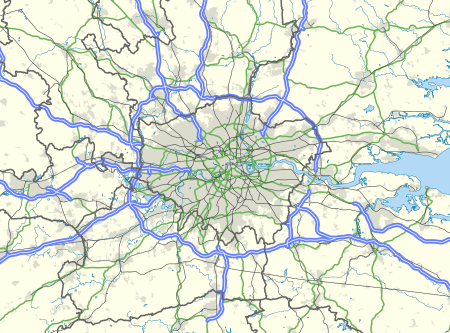 Four towns have between 50,000 and 100,000 residents: Hemel Hempstead, Stevenage, Watford and St Albans. 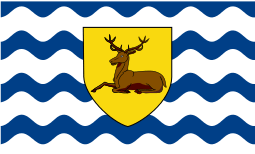 The county town, Hertford, once the main market town for the medieval agricultural county ranks 13th in population today deriving its name from a hart (stag) and a ford used as the components of the county's coat of arms and flag. Elevations are high for the region in the north and west. 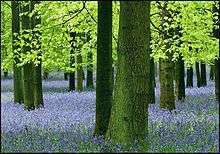 These reach over 240m in the western projection around Tring which is in the Chilterns. The county's borders are approximately the watersheds of the Colne and Lea, which flow southwards each accompanied by a canal. 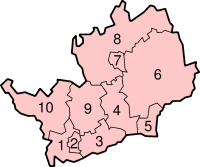 Hertfordshire is at the edge of the London Basin and most of its undeveloped land is agricultural and protected as Metropolitan Green Belt. The volume of intact medieval and Tudor buildings surpasses London, in places in well-preserved conservation areas, especially in St Albans which includes some remains of Verulamium, the town where in the third century AD an early recorded British martyrdom took place. Saint Alban, a Romano-British soldier, took the place of a Christian priest and was beheaded on Holywell Hill. His martyr's cross of a yellow saltire on a blue background is reflected in the flag and coat of arms of Hertfordshire. The county's landmarks span many centuries, ranging from the Six Hills in the new town of Stevenage built by inhabitants during the Roman Britain centuries, to Leavesden Film Studios. Leavesden filmed much of the UK-based $7.7 Bn box office Harry Potter film series and has the country's studio tour. The largest sector of the economy of the county is services and it has a large proportion of residents who are City of London commuters. Ten railway lines and three motorways pass through or reach into the county. In 2013, the county had a population of 1,140,700 living in an area of 634 square miles (1,640 km2). This is a table of trends of regional gross value added of Hertfordshire at current basic prices with figures in millions of British Pounds Sterling. Hertfordshire has headquarters of many large well-known UK companies. Hemel Hempstead is home to DSG International. Welwyn Garden City hosts Tesco, as well as Roche UK's headquarters (subsidiary of the Swiss pharmaceutical firm Hoffman-La Roche) and Cereal Partners production facilities, Pure the DAB radio maker is based in Kings Langley. JD Wetherspoon is in Watford. Comet and Skanska are in Rickmansworth, GlaxoSmithKline has plants in Ware and Stevenage. Hatfield used to be connected with the aircraft industry, as it was where de Havilland developed the world's first commercial jet liner, the Comet. Now the site is a business park and new campus for the University of Hertfordshire. This major new employment site is home to, among others, EE, Computacenter and Ocado. A subsidiary of BAE Systems, EADS and Finmeccanica in Stevenage, MBDA, develops missiles. In the same town EADS Astrium produces satellites. The National Pharmacy Association (NPA), the trade association for all of the UK's community pharmacies, is based in St. Albans. Warner Bros. also owns and runs Warner Studios in Leavesden. Wikimedia Commons has media related to Transport in Hertfordshire. 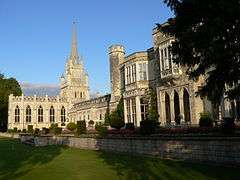 Hertfordshire has 26 independent schools and 73 state secondary schools. 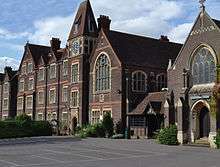 The state secondary schools are entirely comprehensive, although 7 schools in the south and southwest of the county are partially selective (see Education in Watford). All state schools have sixth forms, and there are no sixth form colleges. The tertiary colleges, each with multiple campuses, are Hertford Regional College, North Hertfordshire College, Oaklands College and West Herts College. The University of Hertfordshire is a modern university based largely in Hatfield. It has more than 23,000 students. ↑ "Resident Population". Hertfordshire Local Information System. Retrieved 10 February 2015. ↑ "Area Measurements". Hertfordshire Local Information System. Retrieved 10 February 2015. ↑ Archived 7 August 2007 at the Wayback Machine. ↑ "About the chalk mines". Dacorum Borough Council. 2008. Retrieved 7 February 2009. ↑ Hassan, Jafar. "UK Quality of Life Index". uSwitch. Retrieved 14 November 2013. ↑ Regional Gross Value Added, Office for National Statistics, pp. 240–253.